Introducing the most incredible tool for improving fishing success ever devised by Lowrance, for all HDS displays. With years of developing and testing, to make it right and make it more, Lowrance StructureScan HD sonar imaging takes fish- and structure-finding to the highest level of viewing detail ever achieved. It’s the first to give you full and phenomenal panoramic underwater sonar imaging with picture-perfect viewing. Scans left…scans right…AND for the first time, scans straight down from your boat! The whole, big picture with added extras to remove all guesswork. So you spend more productive time fishing. Select SideScan full-screen viewing for super crisp detail with 600 ft. side-to-side underwater coverage. The amazing StructureScan imaging feature shows targets as well as their imaging scan shadows – game fish and baitfish alike. You cover more water in less time while targeting fish and fish-holding structure with superb detail. Plus, with the unique TrackBack tool, you can easily scroll back in sonar history to find locations and set waypoints. Welcome to the incredible and innovative new dimension in Lowrance fish-finding -- high-detail sonar image scanning focused straight down below your boat! Employ this exclusive StructureScan feature, and there’s no more guessing. Submerged timber looks exactly like timber. So do brush, pilings and stumps. Merging Lowrance side and down sonar scans in split-screen gives you the absolute best of both worlds in high-detail panoramic imaging for fish- and structure-finding on your HDS display. SideScan for wide-area surveys. DownScan Imaging for more well-defined scrutiny. Together, the clearest way to view and attack sweet spots ever devised. Cursor over locations for helpful depth and distance detail for new precision in bait or lure presentations. Here’s an exclusive new Lowrance advantage that’s nothing less than astounding and incredibly helpful. Even with the exceptional Broadband Sounder technology built into most HDS models, traditional 2D sonar displays can be tricky to interpret. Timber, dock pilings and cables, rocks and other structure can look like a school of large fish. Or, a stack of large fish may be mistaken for structure. Not any more. Compare DownScan Imaging with 2D HDS sonar viewing in split-screen, and you’ll remove all doubt. 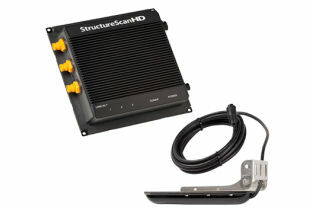 The StructureScan sonar imaging 455KHz transducer works in tandem with your HDS 2D sonar transducer without cross-talk interference. Plus, as an added benefit, comparing the two helps you learn to “read” 2D sonar displays with much greater accuracy.